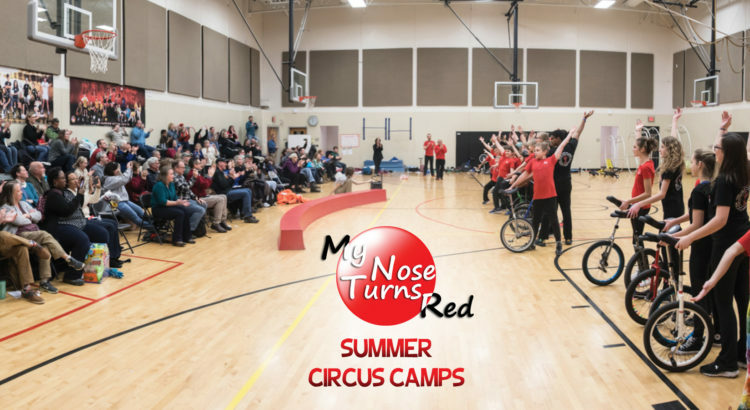 MY NOSE TURNS RED’s summer circus camps are highly engaging and challenge youth to balance, manipulate objects and build human pyramids – all the activities needed to build hand-eye coordination. Circus campers play a wide variety of games that build teamwork, cooperation, trust, and friendship. Circus camps for 4-7-year-olds are half-day, run concurrently with all-day camps for older youth, and have their own coaches who provide fun activities and circus equipment just right for their size. Campers learn stilt walking, (low) tightwire walking, hooping, rolling globe, rola bola, and circus games. Circus camps for 7-16-year-olds also include gym wheel, juggling, pyramids, diabolo (Chinese yo-yo), physical comedy, and games. Two-week camps include aerials, unicycle, and partner acrobatics. Students may sign up for the first week of the two-week beginning/intermediate camps. All camps end with a performance. The intermediate and advanced camp features special guest coach Sam Sake from Chicago. Skills include unicycle, wheel, manipulation, aerials, and balance. If you are not a member of the intermediate/advanced ensemble class or have not attended the intermediate/advanced camp in the past, please contact Steve Roenker. Fill out the 2019 Circus Camp Registration and hit submit. Then scroll down to the PayPal cart, choose your class and pay online. If you choose to pay by check, make the check out to My Nose Turns Red and mail to P.O. Box 14445, Cincinnati, OH 45250. My Nose Turns Red is committed to serving families who are unable to pay. Scholarships are available for children and youth who are on free/reduced lunch. Please contact Steve Roenker, 859-581-7100 for more information.